Well, add one more thing that I will be making at home and never buying again – bagels. This recipe is extremely simple, if you have a stand mixer, then you need to try it! 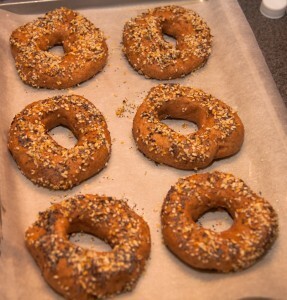 This base recipe is good for just the bagel – variations are highly suggested, I put a few ideas below. 1/2 teaspoon instant yeast (active yeast also worked fine for me). I picked up this stuff, as I need it often and the price is damn good compared to a retail store. 8 oz. 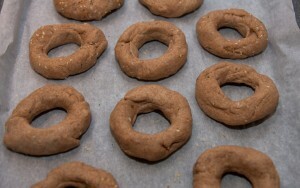 (2 cups) Whole Wheat Flour. I use this stuff, usually priced about 75cents a pound at Wegmans, and there are often coupons in the Sunday paper. In the bowl of your stand mixer, combine the above 4 ingredients and whisk together until everything is incorporated. Cover it with plastic wrap and let it sit at room temperature for 2 hours, by then it should be bubbly and will collapse a little if the bowl is tapped on the counter. 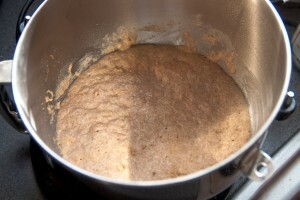 Mix the yeast in with the sponge so it is well incorporated, then add the rest of the ingredients into the bowl. Using the dough hook on low, knead the dough until it is smooth and elastic, it took about 5-6 minutes for me. If you have any variations that you want to be part of the dough, add them during this kneading cycle. 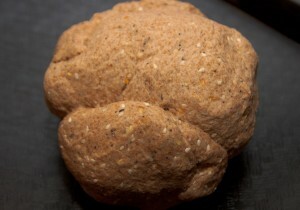 Divide the dough into 3 oz. 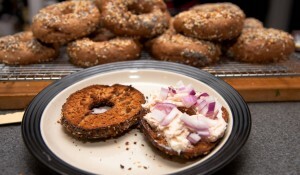 portions for smaller bagels, 4.5 oz. 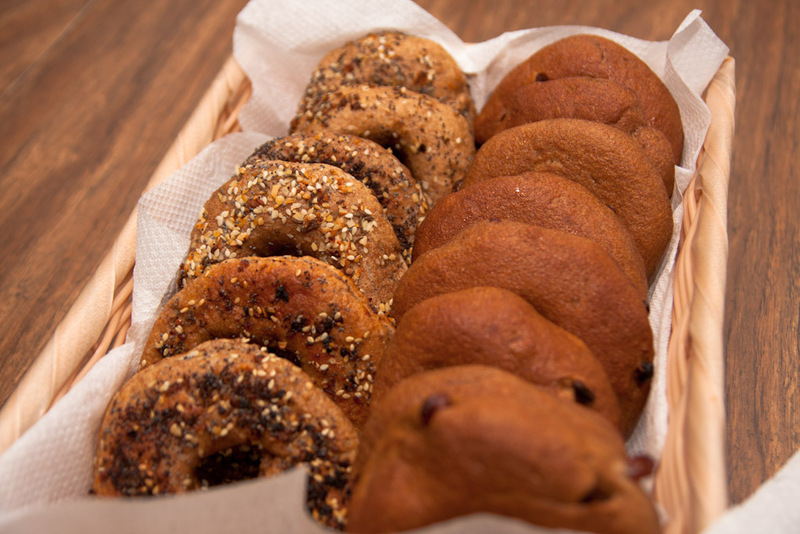 portions for larger bagels. 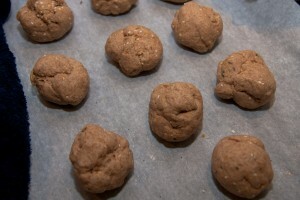 Put the dough balls on a baking sheet sprayed with cooking spray, and cover with a damp towel and rest for 20 minutes. Pick up each dough ball and push your thumb through the middle to make a hole, then stretch out to make bagel shapes. Put the bagels back on the baking sheet and let rest again for 20 minutes, cover with plastic wrap that has been sprayed with cooking spray. 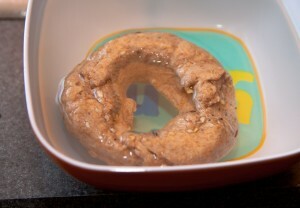 To see if the bagels are ready to rest in the fridge overnight, put one of them in a shallow bowl of water. If it floats within a few seconds (See below), then it is ready. 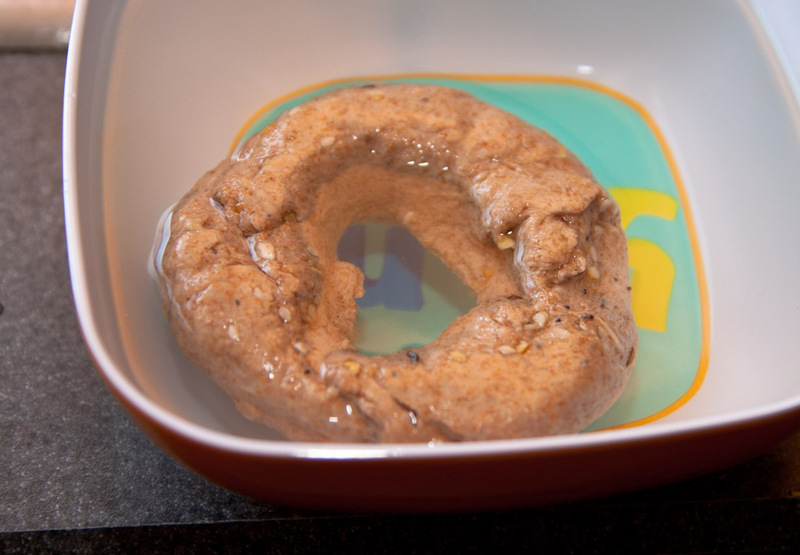 Dry off the test bagel, place it back on the baking sheet, cover with plastic wrap, and place into the fridge for the night and up to two days. Plan bagels are boring – so I make flavored ones. Possibilities are endless, so try whatever you like! Just be careful about adding sugar or anything fermentable before the rise, as the yeast will eat it and you may end up with a much larger rise than you expected. 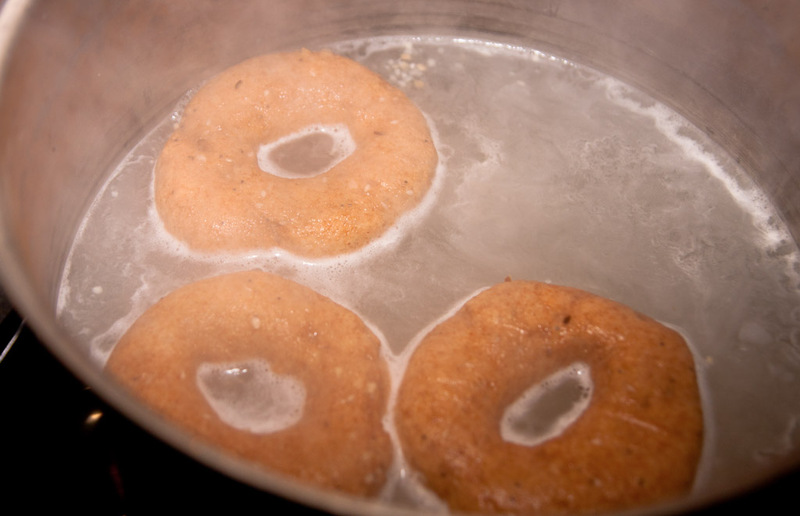 Preheat your oven to 500 degrees, and bring a wide pot of water to a boil. Add 1 tablespoon of baking soda to the water pot. Remove the bagels from the fridge, and gently drop into the boiling water. Boil for one minute, turn them, and boil the second side for another minute. Remove them from the boiling water and onto a rack to dry out for a few seconds. Once they come out of the boil, now is the time to dip them into any seasoning, such as for everything bagels, rye bagels, garlic bagels, etc.. Remove from the oven, cool on a wiring rack for as long as you like, and enjoy! I would wait about 10-15 minutes until serving. Enjoy with some of your favorite spread!